Read what we pack when traveling! One of your most frequently asked questions is in regards to what and how to pack for your cycling adventure. There is nothing worse than struggling in airports and train stations with heavy luggage. We know! How can you pack efficiently and include cycling clothing and gear, casual clothing, and have room for something nice for that special dinner? There is now a category of multi-functional clothing called "travel clothing", made of technical, lightweight, and wrinkle resistant fabric. One pair of "convertible pants " with zip off legs can serve as pants, capris and yes, even, if in black, "evening" wear. You would be surprised how a colorful scarf or bright shirt/blouse can transform an outfit. On a bike and boat tour, in which the cycling is more casual, those convertible pants, can actually serve as cycling attire as well, with the addition of a lightweight padded undergarment. Depending on your style, we have even seen very comfortable active-wear dresses/skirts that one can cycle in and dine in! This clothing can be washed in the sink of a hotel or boat and hung to dry. Your final packing list will, of course, depend on where you are going, the type of tour that you are participating in, and your time of travel. Layers work best for all types of conditions. Shoes for both cycling and walking/casual. There are very nice firm soled shoes/sandals that can serve as both! Extra layers, depending on the weather. Look for technical fabrics/active wear. A small backpack that you can put in your pannier and use for valuables that you want to carry with you when stopping along the way. "I put most of my stuff in ziplock bags. I bought the biggest zip lock bags I could get. I then fold my clothes neatly, put them in the bag, squeeze out as much air as possible, and zip it up. Your clothes stay the way you folded them. There are great videos on the internet on how to fold/roll your clothing to save space.You put outfits that you wear together in the same bag. A bag for your underwear etc. You can also use smaller bags for all your socks. In this way, more fits in your suitcase. Take as little cotton as possible with you. Cotton is too heavy and takes too long to dry in case you need to wash it. 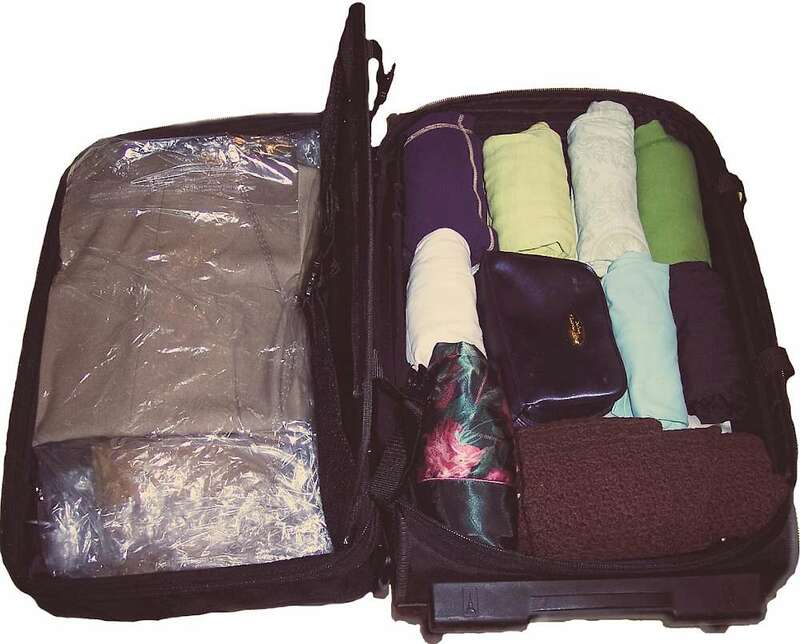 I travel with only a carry-on by packing travel-friendly items that take up very little space." See our Blog Post How to Survive a Long Flight for more travel tips!